Please follow the TRF Rules and Guidelines when posting. PurePeople has a gallery of the events of members of the royal family during the last week. The flowers at the table at the Royal Palace at the Sweden Dinner this evening, from the Facebook of the Royal Court. Gallery. The ladies can choose a long or a short dress, so the queen has a long dress and Victoria short, like last year too. True that this pink dress fits her very well. The king and Victoria had on Wednesday an audience with Håkan Wirtén and Ulf Holmberg from WWF at the Royal Palace. No photos yet. The royal court published the annual report of 2013 on Monday 19th. It is only in swedish so far, the english version will be put on the court website later. I couldn't find the National Day forum for this, but I just saw on FB that Chris and Madeleine will open the palace doors this year. The king, Victoria and Daniel had lunch with Ylva Berg, the new ceo of Business Sweden. The king, queen, Victoria and Daniel have tomorrow lunch with archbishop Anders Wejryd and his wife. 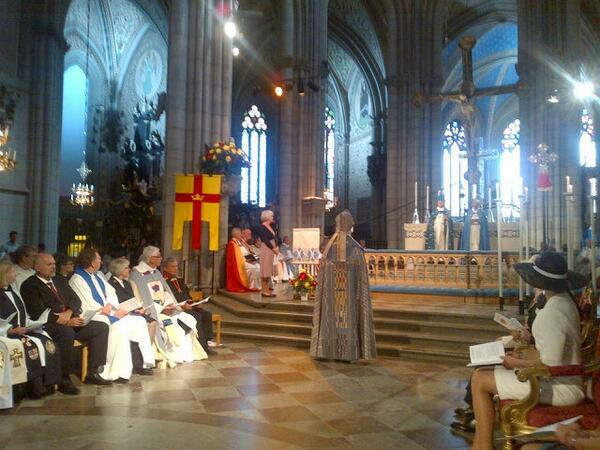 On Sunday Sweden gets it's first female archbishop and the king, queen, Victoria and Daniel attend at the archiepiscopal ordination of Bishop Antje Jackelén at the Uppsala Cathedral. The royal family celebrated Madeleine's birthday yesterday evening in Drottningholm. According to Aftonbladet, Madeleine arrived right after 20.00 and left home three hours later. At Aftonbladet's photos you can also see Victoria, Daniel and Carl Philip arrive. Obviously Chris didn't attend, he isn't at the photos. And no Sofia either. King Carl Gustaf and Carl Philip attended at the Stenhammar Day on Monday. The Queen and Princess Madeleine will visit Washington DC on the 25th and 26th of June with World Childhood Foundation...one of the events they'll probably attend is the thank you concert, which is part of the Thank you campaign created by princess Madeleine. King Carl Gustaf, queen Silvia, Victoria and Daniel met today Carl Bildt, the Minister for Foreign Affairs and Caroline Vicini, the Head of the Protocol Department of the Ministry for Foreign Affairs. They discussed about planning of next year's state visits and official visits. I would find it quite odd if there wasn't an incoming state visit this year. And while looking at the history of Sweden and Finland, there will be a state visit to Finland, I think next year. SVTplay shows live the archiepiscopal ordination of Bishop Antje Jackelén from Uppsala Cathedral. The king, queen and Victoria attend.